It is known to those Beatles fans who dig a little deeper into the world of Bootlegs, that Paul McCartney had, and maybe still has, the habit of starting projects, doing a lot of work on it and then lay it to rest in his archives. Most of these projects disappear forever. That goes for TV specials, like "One Hand Clapping" or "Rockestra", for film projects like "The Bruce McMouse Show" or "Rupert the Bear", but also for album projects, like the double LP-versions of "Red Rose Speedway" and "McCartney II". Many of these projects have appeared on bootlegged videos or records over the last years. Probably the biggest officially unreleased album project is "Cold Cuts". It was a "Best of Leftovers" from various Wings Sessions during the Seventies. The album was first approached in 1978 and for the last time during the mid 80's. In 1978 it was shelved in favour of "Wings Greatest". In October 1980 Wings again worked on it, but due to John Lennon's death and because of the fact that Wings did end as a group early in 1981 this release also never happened. In the mid 80's it again stayed unreleased, instead the second Greatest Hits project "All the Best" appeared in 1987. Thanks to the Bootleggers all planned compilations are accessible for our examinations. You should think that once the album is planned and completed for release, it should be perfect and so you can take the same mixes for every new try at releasing it, but not when Paul McCartney does it! Every compilation of "Cold Cuts" had different mixes and was including a different line-up. Because of this fact there are some songs, that are available in up to five different versions. There are Basic Track recordings of some songs, then there is the first final mix (from each actual recording session), plus the different mixes from the three planned line-ups. In my CD-Inlay's I have given these different versions the description of "Final Mix 1", "Final Mix 2" et cetera, except for a few tracks that were obviously different from the rest (Basic Tracks, Monitor Mixes). For my examinations I am relying on the 3-CD Bootleg " Complete Cold Cuts", released in the summer of 1998 (cover see above, the link brings you to the information about the Bootleg, that is on the "Bootleg Zone"). 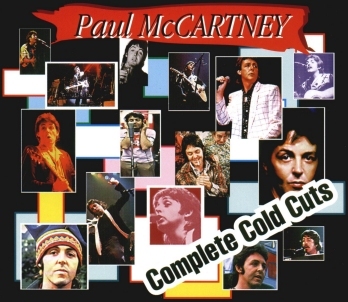 I am not sure if it includes the best sounding versions available for the tracks, but it includes practically all available versions for every song planned for "Cold Cuts". The tracks are listed in alphabetical order, the years behind the tracks are the years of the original recording (not counting later overdubs), except as noted. On certain versions it gets obvious, that we are not really dealing with "different" mixes, but the same mix, only presented in better or worse quality, with different playback speed or reversed stereo, for example. But since this page is most of all made to tell the tracks apart, based on their original bootleg sources, those different sounding versions are called "Mix" as well. Thanks to Peter Gustenhoff in Denmark for his feedback on this subject! - Recording doesn't start immediately, but after a few instrument notes and Linda's comment "Fun City Arizona, Reggie..."
- No backing vocals on "Ahhh, but nothing changes..."
- Backing vocals on "Ahhh, but nothing changes..."
- Paul's voice goes down on the word "...all that's left is the dark below..."
- Paul's voice goes down only on the last syllable of "...all that's left is the dark below..."
- Higher voice on "oooh, Tragedy..."
Discs marked with an * are the best available source, according to The Core Collection by Doug Sulpy and Chip Madinger. All discs are CD's, except as noted.